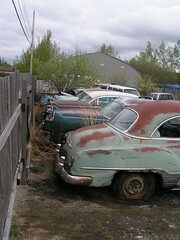 Dopp Juice Archive » Blog Archive » If websites are like cars, then where are the Jiffy Lubes? Brilliant analogy, brilliant post. A lot of good food for thought. It’s obvious that maintenance is not always going to be performed by the person who built the site, for all kinds of reasons. On the other hand, I prefer to work on sites that I’ve built from the ground up… Too often, I’ve had clients come to me with sites that were designed in the weirdest, wonky, messed up ways. I’ll go in to make a simple change or addition to a blog only to find that the templates have been heavily customized by someone who has thrown out much of the core code in a way that prevents redesign on the fly and requires starting almost from scratch. So, while I love the idea of a blog/site Jiffy Lube, I wonder how well it will work without greater adherence to standards (or at the very least, convincing designers to heavily comment any custom code for future reference)? I’m gonna have to think a bit about this. 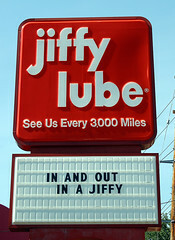 The reason Jiffy Lubes are possible is that cars are a lot more standardized than websites. An oil change is basically an oil change. Jiffy Lubes only do a standardized set of procedures – anything more complex you have to take to a mechanic, who charge you basically the same way a web designer does. There are computer-service companies that are just like that, they’ll “de-virus” your computer for $50, etc. The problem with websites is that they aren’t built by a handful of manufacturers that roughly agree on how the internal combustion engine works. If everyone and their mom had a copy of Frontpage Car Builder, and created their own cars, then the Jiffy Lube model wouldn’t work for cars either. The trade-off in everyone being able to be a “car” engineer (website designer) is that everyone has their own idea of how a site should be build and run. So most web designers would rather redesign a site from scratch every few years than maintain it for 20 years like a Toyota. Jiffy Lubes were invented in the milieu of a mature auto industry – they are a byproduct of many years of standard practices. The web industry is still a baby, learning what it can do, learning to walk and crapping in its diapers – and we have no idea what it will look like when its grown. You can’t demand Jiffy Lubes, you’ll have to wait for them to evolve in the marketplace as people find the parts of websites that can be standardized into a set of procedures. I’m sure ‘WordPress maintenance service’ – we’ll upgrade your blog, etc, etc. is pretty do-able right now. Because it’s working with a standard system – a certain model of car if you will. You already see web shops specializing in creating and working with sites made with a certain software program – that’s the closest equivalent I think. But it would be foolish to create a Jiffy Lube type business for completely homegrown websites – it just wouldn’t be profitable because too much customization means you can’t make a profitable system/franchise out of it.